JOHNS CREEK, GA--(Marketwired - May 2, 2017) - Saia, Inc. (NASDAQ: SAIA) announced today that Saia LTL Freight's new terminals in Harrisburg, Philadelphia, and Pittsburgh, Pa. and Newark, N.J. are operational. "Our teams have been hard at work making sure the new facilities in Pennsylvania and New Jersey are fully staffed and have the necessary equipment and technology in place to service our customers," said Saia Chief Customer Officer Ray Ramu. "Customers have been extremely positive about our expanding geography. We are looking forward to the future success of our Harrisburg region." The four facilities have a total of 185 doors and over 80,000 square feet of space. Nearly 100 employees have been hired and trained as part of the expansion. This year, investments in equipment, infrastructure, and the new Northeastern terminals should total approximately $220 million, including the recent purchase of a facility in Maryland, which is scheduled to open in September. "By making these investments, we are positioning ourselves for growth," explained Ramu. "Our expansion into the Northeast is part of a multi-year plan to increase our network to better serve our customers and their shipping needs." Saia reported its first quarter financial results last week with revenues of $317 million, a 9.4 percent increase, over the same time period last year. Less-than-truckload shipments and tonnage rose 3.5 and 2.0 percent, respectively, year-over-year. 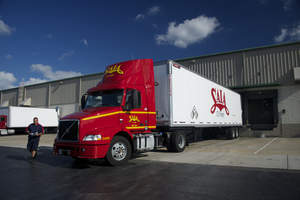 Saia, Inc. (NASDAQ: SAIA), with 2016 revenues of $1.2 billion, offers customers a wide range of less-than-truckload, non-asset truckload, and logistic services. The company operates 152 terminals in 36 states. With headquarters in Georgia, Saia employs over 9,000 people nationwide. Saia LTL Freight has been recognized by the American Trucking Associations Safety Management Council with first place honors for its outstanding safety record. For more information on Saia, Inc. or any of the service groups, visit www.saiacorp.com. Saia LTL Freight is now servicing the states of Pennsylvania and New Jersey with terminals located in Harrisburg, Philadelphia, and Pittsburgh and Newark.